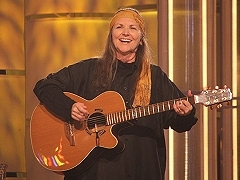 Rattlesnake Annie is a unique singer/songwriter with her roots in the tribe of Cherokee. Early in her career she got to perform on the Grand Ole Opry with Mother Maybelle Carter and Roy Accuff as a member of the Galimore Sisters. 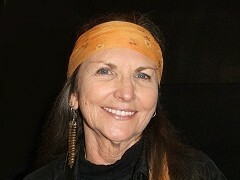 In the 60's she was extensively touring and co-writing with Willie Nelson and Billy Joe Shaver, with whom she's been working up to date. 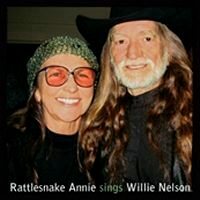 Rattlesnake Annie has achieved a great international success becoming the first female artist to perform in Eastern Bloc in 1982, recording with Czech country artist Michal Tucny and earning a recording contract in Tokio, Japan as the first country artist ever. She's very busy playing around the world including annual tours in India, Japan and Mexico. 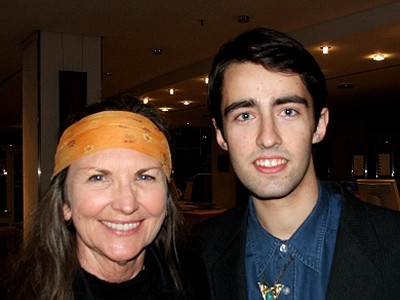 I interviewed her at the Germany Country Award in Erfurt, Germany. You were growing up at cotton and tobacco plantations near Kentucky and Tennessee borders. Did this environment influence your music in any way? "Yes, I think it influenced my music more because we did not have electricity. And all of the family had nice instruments. We had nice instruments before we had a car, before had electricity, before we had a nice cover on the floor. Because music was our food and so I always grew up with live music. And I was destined. I got my first money when I was 8 years old playing music." First you played with the Galimore Sisters. When and why did you decide to start your solo career? "Well, I realised that all the young women were being prepared to be the wives of farmers. And I did not like farm work. I loved music. So when I was 16 years old, I took my guitar and I went to Memphis and started trying to be in the blues business. And of course my two cousins who were singing in the Galimore Sisters were married very very young and that frightened me. I knew if I were to avoid and escape this life that was being prepared for me as the southern woman then I had to run away and go away from it." And why Rattlesnake? Why did you choose this name? "Well, the name chose me. My grandmother called me Rattlesnake. It's the healing sign of the Cherokees. But the main reason was because I had no fear of snakes as a child. I don't know why. And it was very common. Everything in the south has a name: every cow, every horse, every car, every truck, every kid. So we have names, nicknames." When did you first notice there is a little country in the midle of Europe? "From my very beginning of my life I imagined that I would have an international career. And that has always been my focus. I did not know where the Czech Republic was. My first introduction to a foreign person was photographs of the Japanese that the guys brought home from the war, my uncles and grandfather. I always was thinking when I was working in the fields if I'd hoe very deep I'm going to see a little Chinese person there. And so I really had this great dream to have an international career from the very very beginning. The minute I got to Nashville I started looking for a way out of America to expand." How did the cooperation with Michal Tucny and Zdenek Rytir start? Well, first of all that's the most important and wonderful thing in my life was that relationship with Michal. That relationship started in 1981 and the moment that we were invited to come there it was very mysterious, you know, we got all we were communicating via telegram and everything that came to us had no signature. You know, nobody ever signed a thing. We never knew exactly who we were dealing with. And so when the first time we came to Prague in 1981 and the big grey door opened and security and there he was standing with flowers and his overalls and Marta and little children. And we loved each other the very first moment we met. I think that's evident in our duets and our stages I think that you can feel that relationship, that great thing we had together." And what did you like most about him? "I liked his humor, I liked his kindness, I liked his openess, and he was a great musician. He was a wonderful singer. He had a magic with the audience. And I am so happy that he is loved still these days, that his memory lives. I think it's great." Except for Michal, you did some more co-operations in the Czech Republic. You played with Allan Mikusek, Dan Koreda and the band Newyjou. "Yes, I found these people myself. When the wall came down and Sony moved in, even before I signed with Sony I found Allan. I'm not exactly sure, maybe Misa, the daughter of Michal Tucny, introduced me to him. I took him with my money to the studio and recorded 'U Nebeskych Bran'. Then when I signed with Sony and I said "Please take this artist with me", because I felt like Allan is a great singer and I felt like he needed a chance. And it's difficult for Czech artist to get a major label attention. So I felt it was my job to bring in new people. I found Dan, so they became a part of my project because I brought him before I got my Sony deal." Your song 'Letters To Olga' is inspirated by Vaclav Havel's famous book. Do you know his work more closely and what feelings do you have of it? "Well, first of all I'm a reader and I'm interested in politics. I can't tell you what it was like to suddenly be in the middle of a powerful comunist place. The all those things that involved, the lack of freedoms and I became interested in Havel in those days. I was aware of what was happening politically. And I always felt very close to that situation somehow. And I loved his writings and I loved how Olga stood by him and to me it's just a beautiful beautiful story and I just thank the great spirit I was, I had the gift of that song." When were you in the Czech Republic last? "I did a tour of the Czech Republic in 1997, which was very interesting. The old small towns, old theatres. Then in 2000 in the 5th anniversary of Michal's death I played in Hostice and I guess I go again this year." Do you like the festival in Hostice? "Yes, very very nice. A lots of people there. You know, I was staying in house with Marta and I get to renew my relationship with the family. I love that." You have travelled all around the world for many years. What country is your favorite? "Well, that's not fair! Of course I think I have the most intimate relationship with the Czechs. That's because the long relationship playing in many many cities I got to really feel a part of that. In the moment Japan for business. I really enjoy the Japanese, who have the second largest economy in the world, and they're not concerned about age. They believe that age is wisdom and you're not forced to have that Barbie doll image." Can you see any differences among American, European and Asian approach to countr y music? "Absolutely. I mean, you know, first of all, I'm not in the country music business in Japan. It's very no country music business there. My music is more blues and I sing more of my own songs because Sony helped me to have three CD's. They helped me introduce in the Japanese world a music market of my songs. They first released 'Indian Dream' which was all of my songs and so. We have to always understand. It's that everywhere outside of America that country music is ethnic music. I think it's more the part of the Czech culture then any of the others countries because everybody has summer houses and there is close of contact with nature for the Czechs. They are great bluegrass players I think some of the best outside of the American bluegrass players. Even here in Europe if you're playing in France you have more of the blues, you can sing more blues. And I look in Switzerland, in the German part of Switzerland it's a different show you must do if you wanna play in the southern part. I see it as ethnic music and it depends on the culture of the country and how they take it." Last summer you were on tour with Willie Nelson and Bob Dylan. What was it like? Did you enjoy it? "Well, I love being with them. It's very interesting and it was like a big circus. It was fully contained, the trucks with the sound, the trucks with the stages, the truck with the lights and it was very, very interesting production. And very interesting to see all the young people that were so interested in Bob Dylan. And you know, of course, a lot of the younger are also interested in Willie. Willie tours more than Bob Dylan so it was fun and he always wore disguises." Can you describe your new album a bit? "Yes. 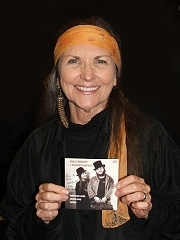 This album is old songs, mostly old songs that Willie wrote in the 60's and the 70's. They are very beautiful and emotional songs about his relationship with his children, his divorces, his getting married again, his falling in and out of love. The one song I told him I was going to record this project, I asked him 'Which song would you like for me to sing? What is your favorite?' and he said 'The Healing Hands of Time'. That's number 10 I believe on the album." I noticed the re are some superstar musicians on that album such as Mark Castevens and others. "Yes, actually, Mark played on my CBS album in 1987. And he was the very best person for that, I wanted a guitar player who could play acoustic gut string that could play in the style that I play only much much better and he was so great to work with. We have a free production meeting and we worked out all the songs. This is the third album I have worked with Mike Bub, the bass player. And of course Lloyd Green we worked a lot together and so if you will notice when you hear the album just all acoustic and one lead instrument. For example, in one song I used only an accordion. 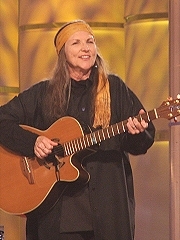 In one song Willie's sister Bobby plays piano. It only features one instrument." What are your forthcoming plans for this year? "To keep on doing it. I'm writing on a new album and I'm in Mexico writing now. You know the songs that have been most successful for me internationally have been songs like 'Indian Dream', 'Adios Last Cowboy', 'Goodbye to a River'. Yeah, 'Goodbye to a River' is incredible. The wings of that song still goes and goes and goes. I'm trying now to focus again on writing more songs. I like these series of like Hank Williams tribute and Willie Nelson. I like this to do but I also need to take the time to write my songs. That takes a lot of focus." (C) Petr Mecir 2005. All rights reserved.